For women in the summer there’s one item that adds an undeniably cool touch: denim shorts. Specifically, short denim shorts. A pair of denim shorts, a white t-shirt, and ballet flats (or gladiator sandals) with beachy, just-rolled-out-of-bed-with-my-rockstar-boyfriend, hair has an inherently no-try vibe to it. And when the temperatures reach 27°C/80°F a no-fuss, rock and roll, vibe is everything. There’s no question who the Queen of cool is in fashion. Especially summer fashion: Kate Moss. And there’s no question what the coolest bottom for women to wear in summer is: Denim shorts. Prancing around Primrose hill, Kate Moss made short denim shorts an it-item again in 2005. From there the American cool girls caught on quickly… Kate Bosworth, Nicole Richie, Mary-Kate Olsen, and Ashley Olsen all rocked denim shorts in proceeding years. But the cool girl who kept the denim shorts train running past 2007? Alexa Chung. Alexa Chung brought denim shorts to a new widespread level. Instead of wearing denim hot pants like Kate and the girls, she took it one step further: high waisted denim shorts. Specifically: vintage high waisted denim shorts. 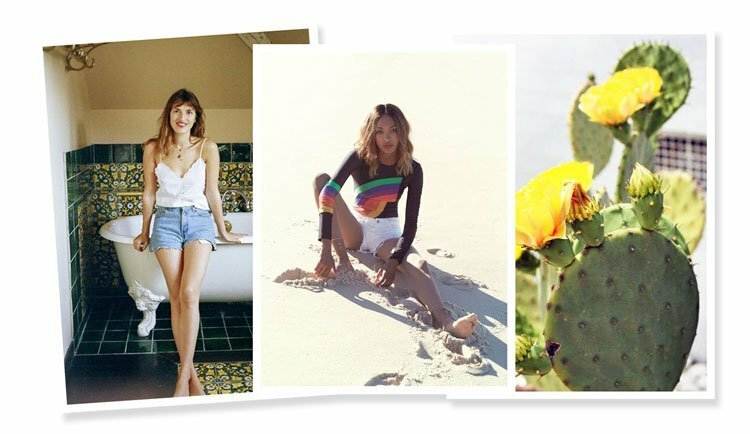 From there, Pinterest and Tumblr hopped on board with Jeanne Damas as the denim shorts conductor and the train continues full-steam ahead. There’s nothing worse than denim shorts that are a bit too tight. After all, will you really be comfortable if they’re sucking at your thighs? The best pair of denim shorts are looser around the leg, but not too loose. Sit at your waist if they’re high waisted or sit at your hips if they’re low waisted. Unlike your skinny jeans, you shouldn’t have to hop around to get into them. Save that for when your favorite band is playing on the Summer Stage. Will they fray even more in the wash? Perfect denim shorts hold their shape (and get a little softer), don’t bleed onto your bag or shirt, and the edges don’t get more distressed with each wash.
Are your bum cheeks hanging out? The jury is out if this is a good look or not. If you dig it, go for it (with a more conservative top of course), if you don’t, pass. Will you be sick of them next summer? Too trendy and you won’t want to wear them in a year. Are you actually comfortable in them? If they make an imprint on your stomach after wearing them, they probably aren’t the right pair. Too tight and they’ll be too uncomfortable in the heat. When you put on the right pair, you know immediately. It isn’t a question of “oh these will grow on me.” The wash, the amount of fraying, the rise… It’ll all fall into place the moment you put them on. Music festivals, barbecues, late night drinks on your local’s patio… The best denim shorts have your back and never make you feel out of place OR uncomfortable. To find a good pair of denim shorts, you don’t have to go over $125. With that said, if you do happen to find the perfect pair after years and years of searching, but they’re more than that, don’t feel guilty about splurging. If it’s perfect, it’s worth it. You should and could spend less than that. If you’re a more crafty person, try a D.I.Y. If you’re less crafty, try thinking outside the brand box. Try Abercrombie or even Hollister. The perfect denim shorts are out there in a grove of lemons. You WILL find them eventually.